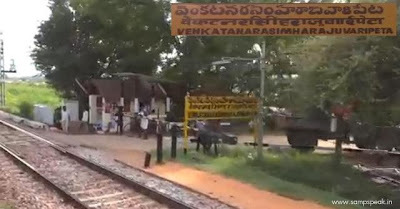 English is a foreign language and native speakers often get confused …. ‘hypocrisy is of course different than hypocorism’…….. Hypocrisy is the state of falsely claiming to possess virtuous characteristics that one lacks. Hypocorism is a shorter or diminutive form of a word or given name; though shortening of names is certainly not exclusive to terms of affection. Referring to British people, we often hear - Bob, Ted, Ed and more… the famous fast bowler - Robert George Dylan Willis (RGD Willis) was Bob Willis; Australian Robert Baddely Simpson was Bob Simpson; Michael william Gatting being called Mike Gatting was more understandable. Understand that in English – Edmund, Edward are : Ed, Eddy, Ted… Richard is Rich, Richie; Robert is Bob, Bobby, Robin, Theodore is Ted, Teddy…. 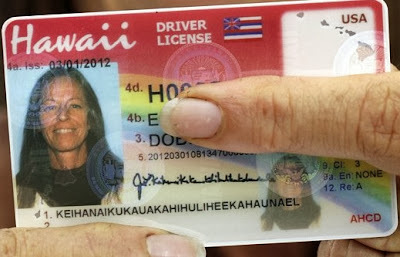 Read of this interesting post on Daily Mail of a Hawaiian woman finally geting new ID card with her full 35-letter name on it………….. A Hawaii woman whose last name is 36 characters long has finally gotten the whole thing to fit on her driver's license and state identification card. 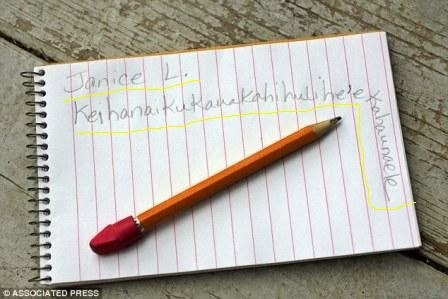 Janice 'Lokelani' has a surname that consists of 35 letters plus an okina, a mark used in the Hawaiian alphabet. She received her new license and ID after her campaign to get her full name on the cards prompted the state Department of Transportation to change its policy to expand the number of characters that can appear. Keihanaikukauakahihuliheekahaunaele, 54, said that she's happy she was able to help fix the problem of identification cards lacking sufficient space for long names. Here is Janice Keihanaikukauakahihulihe'ekahaunaele’s old Hawaii drivers license that lacked the space for her full name…. 'Now, in the state of Hawaii, we are no longer second class citizens because of the length of our name,' she said. Hawaii driver's licenses and ID cards previously had room for names totaling up to 35 characters. The new policy allows 40 characters for last names, 40 for first names and 35 for middle names. Ms Keihanaikukauakahihuliheekahaunaele - who got her name after marrying in 1992 - said that her name had many layers of meanings including 'one who would stand up and get people to focus in one direction when there was chaos and confusion, and help them emerge from disorder'.She said it can also mean 'When there is chaos and confusion, you are one that will stand up and get people to focus in one direction and come out of the chaos.' The woman said her husband, who died in 2008, had similar issues with documentation. Janice 'Lokelani' Keihanaikukauakahihulihe'ekahaunaele's whose name is 36 characters and 19 syllables has had trouble over the last 22 years and stated that she had seen the culture of Hawaii being trampled upon and on occasion officials treating her name as if it was mumbo-jumbo. The new policy has made her happy……..